Between Grand and Broom Streets and across the street from the B & D Train Grand Street Station and Sarah Roosevelt Park. We're happy to accomodate your schedule. Please contact us for an appointment at our store or in your home. Please call (212-226-3102) or email (Harris_Levy@icloud.com) for more specific store closings. Traveling by SUBWAY is easy and convenient. Please take either the “B” or the “D” trains to the Manhattan Grand Street Station. 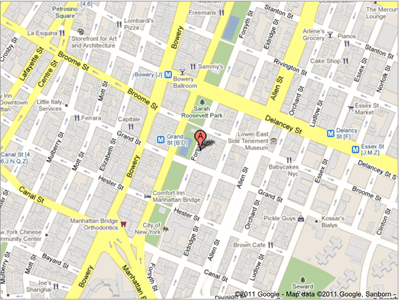 We are located one half block east from the Grand Street Subway Station. You may also take the F, J, M and Z trains to Essex Street and walk south west or the V train to Second Avenue / Lower East Side and walk south east. There are also many Bus Lines that stop in our area including the M9, M14, M15, and M101. Travel South on Second Avenue which turns into Chrystie Street to Grand Street. Make a Left onto Grand Street and then another Left onto Forsyth Street OR Travel South on the FDR Drive to the Exit #4 - Grand Street. Make a Right turn onto Grand Street. Go 2 blocks past Allen Street (Big, Divided Street) to Forsyth Street and make a Right onto Forsyth Street to 98 Forsyth Street which is on the Right. Williamsburg Bridge onto Delancey Street. Make a Left onto Essex Street to Grand Street. Make a Right turn onto Grand Street. Go 2 blocks past Allen Street (Big, Divided Street) to Forsyth Street and make a Right onto Forsyth Street to 98 Forsyth Street which is on the Right. Holland Tunnel to the last exit – Canal Street. Stay Left and make the first Left turn onto West Broadway. Then make the first Right turn onto Grand Street. Go 2 blocks past The Bowery (Big Street) to Forsyth Street and make a Left onto Forsyth Street to 98 Forsyth Street which is on the Right. We are a member of the Lower East Business Improvement District and are proud to offer free parking and free walking tours of this great historic neighborhood. Also be sure to visit our neighbors in Little Italy, China Town and SoHo.